This is an image from a book I've just finished illustrating for Simon and Schuster in New York. The book is called 'Dino School' and as the name suggests, it's about a school for dinosaurs. 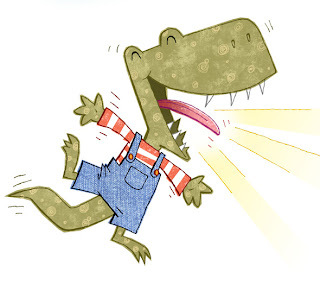 This particular story is about a T-Rex called Teddy, who can only roar extremely loudly. Think Brian Blessed in dungarees with scales and teeth. Actually, don't. It's too disturbing. I really like the dynamic graphic quality of your recent work Mike! Are those skin textures created by hand? All done in Photoshop, John. I used a texture brush that I found and then scribbled on top of that with a very small hard round brush.